Enterprise organizations using Microsoft’s Virtualization platform Hyper-V for their private or public cloud infrastructures will now be able to enjoy the full benefits of what Cohesity offers for the modernization of enterprise data centers. With the latest 5.0 release, Cohesity is introducing support for Microsoft Hyper-V 2012 R2 and Hyper-V 2016. Now all enterprise organization running Hyper-V can deliver shorter recovery points and faster recovery times to accommodate growing business needs. Cohesity enables organization to transform away from the legacy data protection and recovery solutions were designed a decade ago. These solutions are unable to keep-up with today’s modern business needs for data protection and secondary storage. Cohesity DataProtect is specially designed to solve this problem with an entirely new approach for data protection and recovery that is now available for Microsoft Hyper-V infrastructures. Data protection and recovery solutions typically consists of a complex mix of expensive point solutions for target storage, backup software, media servers, proxies, replication, and disaster recovery. Cohesity DataProtect 5.0 is tightly integrated with Microsoft Virtualization platform and provides support for two different versions Hyper-V 2012 R2 and Hyper-V 2016. Cohesity DataProtect 5.0 provides a simple, most efficient, reliable and fastest data protection and recovery possible capable of satisfying the shorter recovery points and faster recovery times demanded by today’s modern business. Automated data protection and recovery: System Center Virtual Machine Manager (SCVMM) integration enables Cohesity to automatically register all the Hyper-V VM disk objects (VHD or VHDX). This allows users to assign simple SLA policies to VMs or groups of VMs in the Cohesity UI and automate data protection and recovery. Optimize the use of storage capacity for data protection and recovery by using both Microsoft’s and Cohesity’s new space efficient based technologies to deliver optimal value. 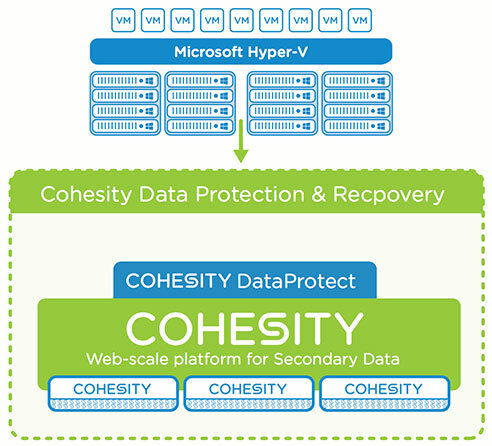 Cohesity will now provide organizations using Microsoft Hyper-V the ability to bridge the traditional “islands of secondary storage” by leveraging the truly global file system and storage efficiency technologies built into the Cohesity DataPlatform. These capabilities help customers in transforming their data centers from silos of dark data to highly efficient, next-generation web-scale Enterprise IT. As an extra capability to customers, once the VMs are stored on Cohesity’s DataPlatform, organizations can then use our native cloud integration services and capabilities with Microsoft Azure for archive, DR, Test/Dev, analytics, application mobility, and other potential use cases.